I'm always a fan of working a piece of clothing in multiple ways. 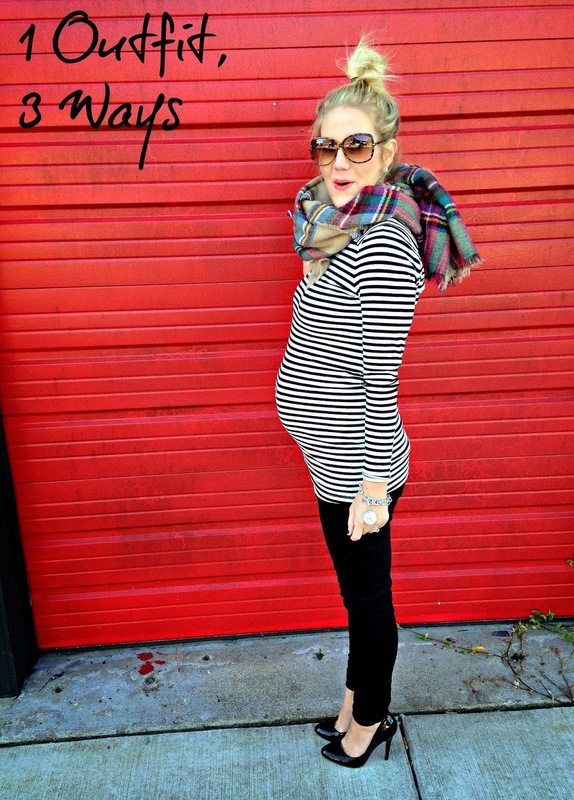 With my pregnancy wardrobe especially, I'm trying to work an outfit in many ways. I have limited clothing options, and try to find as many ways as possible to wear them. 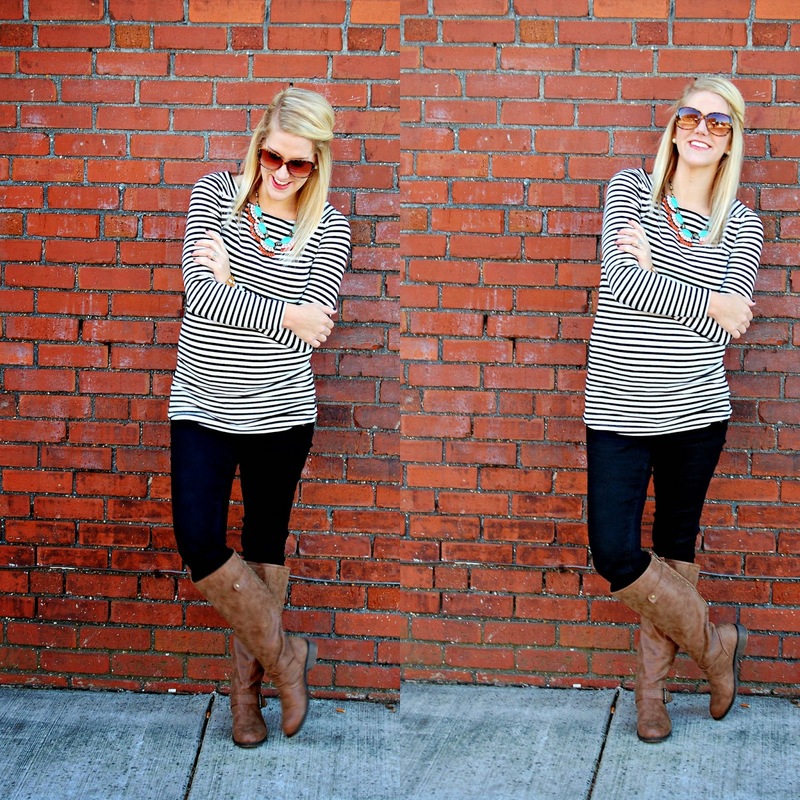 Here's a simple striped tee and black jeans worn 3 ways! A little fancier with heels, and a little pattern mixing with plaid. Probably my go-to with this outfit. Riding boots and a statement necklace. Remember in middle school times how wearing brown and black together was a no-no? !....such a sad time. Keeping it simple with a pop of color and a pop of (my favorite)...leopard print. For more 1 item, 3 ways, you can check out 3 ways to wear oxfords and 3 wears to wear a polka dot shirt! You are just adorable! Love all 3 of these, but the first one is my favorite! Love them all! Thanks for sharing!! These are all so cute! I would wear the boot outfit the most, too. It's so effortless, but put together. You are looking beautiful in all of them though! So, so cute, you and the outfits! Love 'em! These are the best outfit ideas EVER! 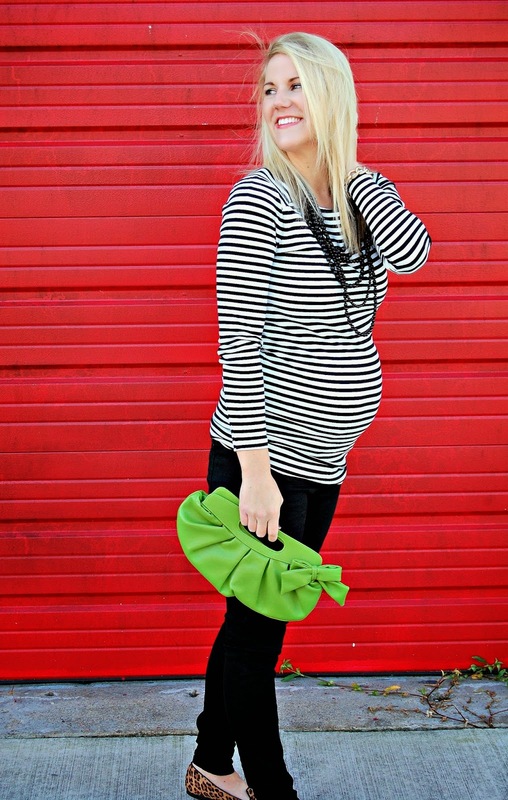 I have a maternity top similar to this so I'm keeping this in mind for my next pregnancy! You rock every look! And you seriously look AHmazing!! I found your blog via Shanna, and absolutely LOVE your style. She's actually coming to my house tomorrow to help wardrobe my closet, and I sent her a link to this post. This is EXACTLY the kind of look that I love, but for whatever reason can never put together myself. Love reading your blog! Teach me how to rock a top knot...please!! Ha, and you in those heels?! Work it, cutie mama! Not "getting" to mix brown and black were definitely sad days. I love brown and black together, thank god it is an acceptable combo now! Also all of these combos are great but the first one is AMAZING! You are the cutest! That scarf is what dreams are made of. you are wearing basically my fall uniform - stripes skinnies and boots!! love it! Your striped and plaid combo is too cute! Love your blog! We just found it and can't wait to follow along! Congratulations!! You look great and this is such a fun look to remix. Way to go! Enjoy your Fall! I knew you could still rock that scarf! So in love with the first outfit! I have been looking for a stiped top just like this one, may need to buy it! I love all these different looks you styled, especially the first one! School days, such a sad time indeed, haha. All of these renditions are so cute, you are just the cutest mamma to be!! Omg your belly is so cute. I can't get over how adorable it is and the fact that you are still rockin' heels and awesome outfits. Love love love it! Love your striped shirt! Your bump looks so cute! I love all the ways you styled this top! You are looking great!!! Oh I love this post! Especially because I am definitely in the zone of wearing things over and over again these days. it's so awesome how simple accessories can really change a whole look! Okay yep, with my next pregnancy all I need is some black pants and a striped shirt. Love the first ensemble, especially that scarf!